Congratulations to Congregation Ahavath Sholom! The search has ended and the synagogue has a new cantor. Shoshana Abrams has agreed to take on the duties of musical director and education director of CAS’ religious school. Her official start date is July 10. According to information sent to us from Martis Herman (who chaired the synagogue’s search committee), the search consisted of a lot of meetings, resume reviews and Skype interviews (what did we ever do before Skype?). The winnowing-down process led to two candidates coming to Fort Worth for in-depth interviews and visits with the congregation. Cantor Abrams has spent time at congregations in Ohio and New Jersey as a student cantor and obtained teaching experience in New York. She’s also lived in California (in fact, she received her bachelor’s degree in music from the University of California, Santa Barbara). Additional education includes a masters’ degrees in sacred music and Jewish education from the Jewish Theological Seminary of America. Marla Chicotsky, daughter of Fort Worth residents Donna and Robert Chicotsky and a criminal defense attorney in Fort Lauderdale, Fla., was a guest on the Nancy Grace Show (CNN) on April 16. The topic involved a difficult one: Two infant deaths, in the Clark family of Texas, have been allegedly linked to co-sleeping habits. Marla gave the criminal law perspective as to how and whether the parents should, or would, be charged in one or both deaths. From what Robert tells us, Marla is a veteran criminal law expert who has appeared on Fox News and Fox Business News in the past. Join former Fort Worth resident Jack L. Schwartzwald on Thursday, May 10 at Beth-El Congregation, 4900 Briarhaven Road. 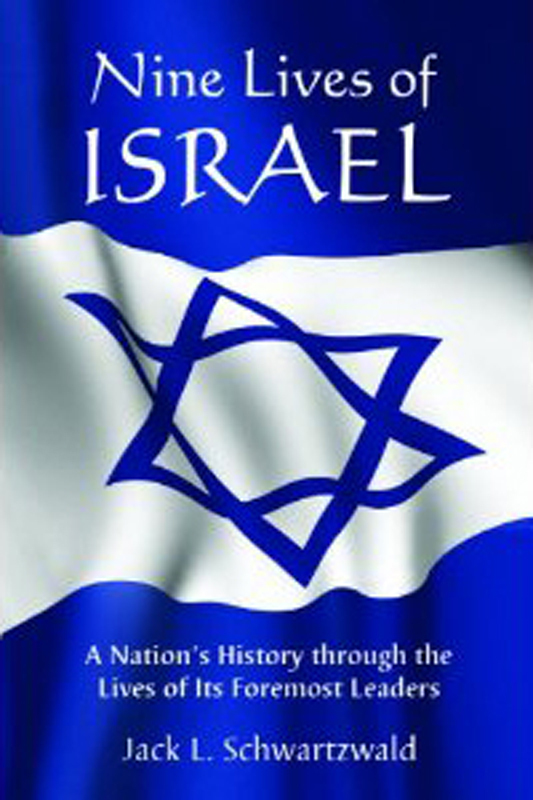 Jack will be signing copies of his book “Nine Lives of Israel,” which discusses the history of the land through its various leaders — from Herzl to Sharon (the whole gamut of modern Zionism). Jack will also give a short talk about the topic and will take questions. These days, Jack is a clinical assistant professor of medicine at Brown University in Providence, Rhode Island (Jack lives with his wife, Cheryl and two cats, Cody and Crosby in Kingston, R.I.). Thanks to Frances Schwartzwald for sending this information — this book looks like a wonderful read and very educational. If you want to say goodbye to the Brands and wish them well, their friends are sponsoring a Kiddush lunch for them following services on Saturday, May 12 at Congregation Ahavath Sholom. If you’re able to attend, please contact Beverly Ross at 817-346-3416 or bross@txem.com by May 2. Also, the Brand’s friends are putting together a book/album for them; anyone who wants to say something special in a note to the Brands, or wants to submit a picture, can send this information to Beverly no later than May 1. There’s still time to catch Madeleine K. Albright, former U.S. Secretary of State through a life satellite broadcast at 7 p.m., Thursday May 3 at Beth-El Congregation. Donations are $3. The annual Fort Worth Jewish Community Blood Drive will take place Sunday, May 6, between 9:30 a.m. and 12:30 p.m. — also at Beth-El. This drive is taking place in conjunction with Carter BloodCare, and while walk-ins are welcome, it’s better to make a reservation. You can do so by calling Dan Halpern at 817-426-3239. Passover is over, but the pilgrimage continues as we make our way toward Shavuot. There are several “modern” holidays between the exodus from Egypt and receipt of the Torah. These are Yom HaShoah (Holocaust Remembrance Day), followed by Yom HaZikaron (to honor those who died defending Israel), then Yom HaAtzmaut (Israel Independence Day). It’s interesting that Yom HaAtzmaut, with its celebration and joy, follows two somber holidays. But it’s important we remember that Israel was born out of the horror of the Shoah and secured through the blood and sweat of its soldiers. As such, though these holidays are “modern” ones, they provide wonderful opportunities for us to talk about Israel with our children. This is a discussion that’s easier to have with older children and teenagers, however. Younger children can have difficulty conceiving of Israel, a far-away country. Few understand the concept of the “United States” or, for that matter, Dallas. But it’s never too soon to build a connection between your child and the land of Israel. Once upon a time, a small boy stood in a field, holding tightly to a string that led to the sky and clouds, where it disappeared. Though the child couldn’t see what was at the end of that string, he continued to hold on to it, looking up at it, and pulling gently on it. Then a man came by to ask what he was doing. “Flying a kite,” the child responded, his eyes on the sky. “How do you know what’s up there? How can you see the kite in the clouds?” the man wondered. The boy smiled, and studied his string. “I know it’s there because of the tug,” he responded. Just like Israel. We can’t see it in our immediate universe, but we know it’s there … because of the tug. Laura Seymour, is director of Youth and Camping Services at the Aaron Family Jewish Community Center. During my recent trip to Israel, I asked Mordechai Fried of Petach Tikvah (who is also my father’s brother — my uncle) to share the family pre-war and war history. In response, I was treated to many fascinating details that I previously had not known, as my father ob’m was loathe to discuss those years. Though the details are somber in the spirit of Yom HaShoah, I thought to share some of them with you. My grandfather R’ Yechezkel Shraga Fried studied in some of the most prestigious yeshivot in Hungary, most notably the Yeshiva Levushei Mordechai in the city of Mod and the Yeshiva of Krastil. He was from a Chassidic family, stemming from Sanz, and was close with the renowned Shinover Rebbe. He studied throughout his life while raising a family of two girls and four boys (one of them my father) with his wife Rachel in the city of Debrecen. He made is living through his shoe factory. He was a Torah reader in shul, shofar blower on Rosh Hashanah and often led the services as one of the most respected leaders of the community. In 1942, he was snatched up by the Hungarians to a forced labor camp. Though a horrible state, being in that forced labor camp saved my grandfather from a worse fate at the hands of the Nazis. Two years later, in 1944, Debrecen became a ghetto, with the Jews forced to clean up the destruction the Nazis had created. The family worked in a brick factory for one month. Afterward, each individual was ordered to fill one suitcase only, and then to board the trains. On May 15 the Debrecen Jews were taken to Austria-Slovakia. Though the Americans bombed the train, it made it through to Vienna. Each day the Nazis provided only one bucket of water per car and one bucket as a toilet. And each day, the elders died in the cars. The eldest sister, Krasu, who was visiting with an elderly aunt and uncle in the countryside when the Nazis took Debrecen, was taken straight to Auschwitz and never returned. My father and his family were first taken to Gossman work camp near the Danube in Austria, there they remained from May 1944 until January 1945 Their job was to build a road; and they were required to walk three kilometers a day to and from work in all types of weather. All day, they wielded five-kilo hammers that shattered rocks into gravel. The youngest brother, my uncle Gavriel was able to find kosher food for the family — they faithfully kept to the rules of kashruth until their lives were in danger from potential starvation. In January 1945, when the Americans invaded upper Austria, my family and other inmates of Gossman were forced to walk three weeks to the infamous Matthausen camp in Salzburg, a camp known for its wall of bones. They remained there for one and a half months; then were forced on a three-day march to another camp, Gunskirchen. During that long, terrible walk, the Nazis randomly shot 17,000 out of the 40,000 who began the march, in the middle of the coldest winter and they needed to sleep out in the cold. They arrived at Gunskirchen, covered with lice, weighing some 29 kilos. After a month there, my family was liberated by the Americans on May 5, 1945. After the liberation there was a typhus outbreak in the camp, and my uncle had to be quarantined for three months. In September they returned to Hungary to look for their father, my grandfather and miraculously found him at home! It turned out that he had been taken to the Ukraine from the Hungarian labor camp — a miracle indeed. In 1946 my father, who was the oldest and drafted by the Hungarian army, bribed a Russian officer to get him onto a train to get to the DP camps in Germany, and testified in Nuremberg. He eventually received a visa to Canada, and married my mother from Detroit. His brothers Dov and Mordechai paid to get over the border of Hungary to Slovakia in ’49 and from there walked to Czechoslovakia through Vienna, a train to Italy and a fishing boat (fit for 50 and carrying 350!) to Israel, where they immediately joined the army. My grandmother passed away in Hungary after the war. My grandfather made it to Israel with his daughter after the Hungarian revolution in ‘56. The entire family, besides my immediate family who settled in Indianapolis, settled in Bnei Brak. My uncle said that this brief sketch can’t possibly capture even a drop in the bucket of the untold suffering they endured, walking daily knee-deep in the snow, murder all around them; a total destruction which defies the imagination. No words or even books could truly describe the torment, misery and constant distress they endured. (Due to space confines I need to leave out many of the more personal stories related). It always amazes me to see people like my uncle, and my father ob’m, after what they endured, to always be happy! It speaks volumes of the Jewish spirit and gives us mountains of hope for the future! I always feel proud when former Dallasites make a difference in their new hometowns. You may remember that last month, Valerie Strull Newberg, daughter of Adrienne and Phil Strull, was honored by the Austin Federation with their Woman of Valor Award. On Sunday May 6th the Chabad Center at Texas A&M University will honor Naomi Heller, a recent Animal Science graduate of Texas A&M University. Naomi is the daughter of Karen and Reid Heller. She is a Yavneh graduate and was the President of the Chabad Jewish Student Group for two years. Chabad will also honor Dr. Keith Paull, who has been instrumental in the Aggie Chabad’s continued success. It’s time to dust off those clubs and hit the driving range because the annual Shearith Israel Golf Tournament is coming up on May 9. It’s all about a friendly competition on a beautiful course, all benefitting family education and family programming at Shearith. It all happens at the Tribute Golf Club in the Colony. Single player entries are $150, foursomes are $500. Sponsorships are available and range from $300 to $3,000. Fore more information, contact Avi Edwards at 763-442-2120 or aviedwards@hotmail.com; Robert Epstein at 214-789-4408 or Macabee1948@aol.com; or Daniel Hersch at 402-416-4381 or hersch.daniel@gmail.com. May promises to be a busy month, and there are numerous celebrations on the agenda. One of the first up, is Southwest Jewish Congress’ Inspiring Women of the Southwest program, which will be held on Thursday, May 3. Six outstanding women will be honored. They are: Carla Bean, Eva Sandoval Bonilla, Vernie Crabtree, Carol Crabtree Donovan, Wei Wei Jeang and Janet Kafka. Event chairs are Roberta Berger and Keo Strull. The event is being underwritten by Harry Ploss in memory of Stella Ploss and will be held at the NTX Event Center and Auto Museum in Richardson (677 W Campbell Road). Tickets are $50 per person. A light buffet and museum tour will begin at 6 p.m. with the program starting at 7:30. For more information, contact Susan Myers at 214-361-0018 or susan@swjc.org. The community is invited to attend The Jewish Youth Tzedakah Foundation Grants Ceremony on Thursday, May 10 at 7:15 p.m. in the Mankoff Center for Jewish Learning (2nd floor Aaron Family JCC). The philanthropic accomplishments of the Tzedakah Foundation members will be recognized. The Jewish Youth Tzedakah Foundation is comprised of a selected group of teens who donate their time to learn about Jewish concepts of giving. The members of the Foundation are committed to supporting ways to improve their community and the world through their donations and hard work. A dessert reception will follow the program. RSVP by May 7 to Gail Herson at gherson@jfgd.org or 972-740-6751. 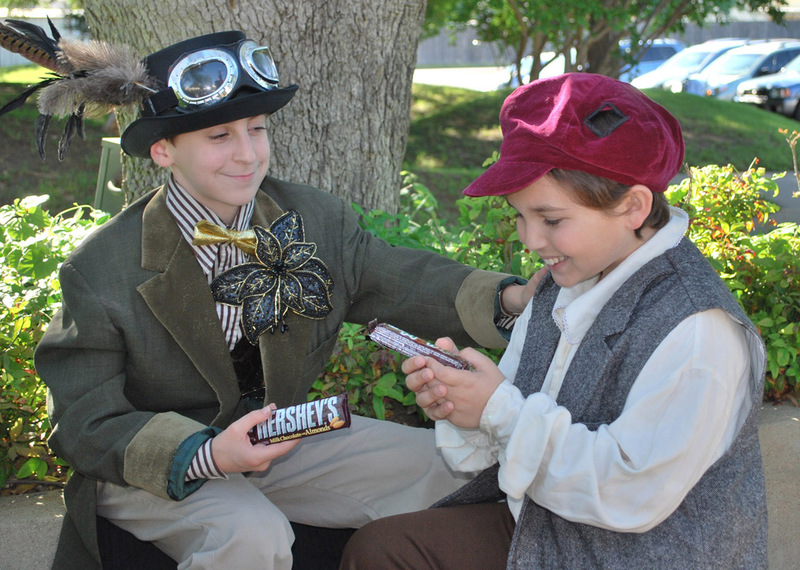 The J Youtheatre will present Willy Wonka Jr. The J Youtheatre will present three performances of Willy Wonka Jr. — Thursday, May 3 at 8 p.m. and Sunday, May 6 at 2 and 7 p.m. in the Zale Auditorium at the Jewish Community Center of Dallas, 7900 Northaven Road, Dallas. Tickets are $12 in advance / $14 at the door for students and seniors; $14 in advance / $16 at the door for adults. Purchase them online at www.jccdallas.org or call 214-739-2737. Tickets are also available at the J front desk. Roald Dahl’s timeless story about a world famous candy man and his quest to find an heir comes to life in this stage adaptation of “Charlie and the Chocolate Factory.” You will leave the theatre singing many memorable tunes including “The Candy Man,” “Pure Imagination,” “Oompa Loompa” and “I Want it Now.” Also, be ready for some fun surprises. The large cast includes the following actors in the 6-9 year old age group: Jessica Aftergut, Jason Bodzy, Ella Forson, Lainey Gutow, Alexis Hamburger, Kyle Hamburger, Kate Henderson, Sydney Horowitz, Claudia Hurst, Ryder Kassanoff, Taylor Levy, Saskia Lewis, Lily McArdle, Hayden McClard, Abbey Platt, Mara Sandberg, Cambell Scheer, Lily Shane, Aiden Singh, Hallie Sternblitz, Alison Thieberg, Lilly Thieberg, Raleigh Toledo, Mollie Zimmerman, Allie Zlotky, Megan Zlotky and Katelyn Zweig. Among the 10-17 year olds are Daniela Appel, Erin Beuerlein, Keyara Clay, Kyre M. Clay, Caitlin Fleisher, Megan Genecov, Jordan Gernsbacher, Jennifer Greenspan, Lilah Harris, Sam Horowitz, Emma Jacobsen, Ileana Kesselman, Sophie Kettles, Jordan Levy, Haley Lieberman, Kyle Prengler, Soleil Singh, Jared Steinhart, Jetlyn Toledo, Normandy Toledo, Samamtha Ungerman, Anna Wernick, Leah Witheiler and Saul Zimmerman. Oompah Oompah Doopity Doo this performance sounds like a winner for you. The 26th annual Bagel Run will start the JCC’s day off on May 6 with the race beginning at 8 a.m. rain or shine. (Registration is an hour earlier at 7 a.m.). Awards will be presented at 9 a.m.
After the race, there will be bagels, all the fixin’s and bounce houses for the kids while the top runners collect their awards. Cost is $20 if received before race day; $25 on race day; the Kid’s K is $8. In recognition of his work with area health care executives and physicians, Michael Bernstein of Independent Insurance Group has been named an MD Preferred Affiliated Insurance Professional. Each year, US Medical Specialties, Inc., a national medical consulting firm, recognizes excellence in service to the medical community in a number of professional disciplines including real estate, insurance, accounting, banking, financial and legal services. The goals of the MD Preferred Program include identifying, acknowledging and promoting agents who provide service excellence to the medical community. Michael Bernstein grew up in a family of physicians in Texas and understands the Texas physician marketplace. As a professional he is dedicated to finding best in class insurance solutions for residents and practicing physicians. Michael is one of the few agents in Texas affiliated with the TMLT and the TMA giving him a huge advantage on his competitors in the medical malpractice marketplace. Through his work with the Independent Insurance Group Michael is also able to provide benefits, life, disability and various other physician relevant insurance programs. He can be reached at 972-388-7086 or Michaelb@indinsgrp.com. Full disclosure: I’m (more than) annoyed with the many people who don’t want to read any more Holocaust books or attend any Holocaust-related programs. We have to move on, they say. But can we “move on” from the Holocaust any more than we can from the Exodus? Both are necessary in our people’s journey to freedom. The repetitive learning of more modern as well as ancient history is necessary because the Holocaust, like the Exodus, is a seminal Jewish experience. Let me tell you a little true story to illustrate. Every year, on the weekend before Yom HaShoah, my synagogue Reads the Names. Beginning after Saturday’s Havdallah until Sunday’s sundown, we say aloud the names of those deceased, recorded in huge books along with the places where they lived, and where they died. Through that process, we give life and voice to those destroyed in the Holocaust. On Sunday morning, while names were being read in the sanctuary, a special program for adults and teens was taking place in our social hall. It concerned the rescue of Holocaust Torahs; four of them, from four different European communities of origin, were held reverently by four young highschoolers. Then, just as the program ended and that quartet of boys rose to return those Torahs to their special places of honor for the day, the piercing sound of the shul’s fire alarm filled the building. What do Jews do when there is a fire in a synagogue? We all know! The four boys never put down their precious burdens, but immediately took those Torahs outside through the nearest door. The rest of us ran into the sanctuary, removed our congregational Torahs from the Ark and carried them out to join the others as the alarm continued to sound. Heavy rain had been forecast for that day, and the first few drops began to fall lightly as we stood huddled together, wondering what to do next since our building has no protective roof overhangs. But the sprinkly shower stopped as the fire truck arrived, and soon we got the word that it was safe to go back inside. Almost immediately the strident alarm went quiet and all the Torahs were returned to their proper places, as dry and safe as they had been before. What caused the panic? Somebody preparing a treat for some Sunday school kids had burned a pizza! We could even muster a laugh when our Learning Center director came by, munching on a blackened crust: Facetiously, we accused her of eating the evidence! However, there were real lessons to be learned from this experience, and they all have to do with irony. The first was how ironic it was that something which had never happened in our shul before “chose” to take place at the very moment we were commemorating the Holocaust and honoring some of its surviving Torahs. This was a stark reminder of several important matters: How many times over history, even as Nazis burned synagogues a half-century ago, did Jews like us rush into those flaming structures to save what was most precious? And how much like those frantic rescuers we became, almost without thought, at less than a moment’s notice. And how quickly tragedy might strike any of us. How to act when we are threatened must always be present in our minds and bodies, just under the surface of our consciousness, ready to rise up and get us moving when swift action is necessary. The second lesson: We might laugh, afterward, at the panic a pizza could cause. But our laughter must be secondary to our fear, our concern, our quick response and our vast relief when all is finally resolved. When we retell this incident in the future — and we will, for it will surely become part of our shul’s history — these, not any ironic “humor,” are the elements we must emphasize. And the third: A wise, anonymous someone said that coincidence — irony — is when God has decided to remain anonymous. Maybe all this did not “just happen”; there may have been a reason. There may also have been a reason why the heavy rains started only after we, like our Torahs, were safe and dry in the protecting Ark that is our shul, as safe and dry as Noah had been in his. The reason, I suspect, was to remind us that we can never forget the Holocaust, or “move on” without it. 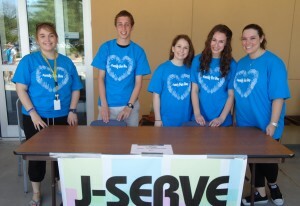 “Inclusion: I’m In” was the theme for this year’s J-Serve. More than 100 Dallas teens gathered on April 22 to volunteer at Family Fun Day at the Aaron Family JCC. Throughout the day, teens were involved in handling and overseeing various carnival events, while buddying up with those in the special needs community. Though the Dallas chapter of B’nai B’rith Youth Organization (BBYO) has coordinated J-Serve since 2010, and though as part of that effort, BBYO teens have volunteered at different organizations, this is the first year that the event focused on a specific collaboration with the Special Needs Partnership of Jewish Family Service (JFS). Davis noted that Family Fun Day was also a way for her to learn how to include those with special needs in BBYO activities if they are ever interested. Approximately 35 special needs kids attended Family Fun Day, and Davis said she would like it to repeat the experience next year. In the months leading up to the event, JFS professionals worked with volunteer teens, training them about inclusion through role-playing exercises. The teenagers were also given tools to help them bond with others who have special needs. BBYO also recently developed a special needs advisory board so teens can have the opportunity to plan events and find other ways to reach out to the special needs community. Teri Kachur, community organizer for the Special Needs Initiative, pointed out that the goal of this year’s event was to build connections between the BBYO teens and special needs kids. “We wanted those with special needs to have a friend for the day and then have that translate into the BBYO kids everyday lives so they know how to befriend someone with special needs in the future,” Kachur added. Responsibility — achrayut, in Hebrew — is important. It’s about community and being part of something larger than ourselves. Responsibility tells us we’re all interdependent with one another, and it’s that connection which makes us strong. Responsibility means accepting the consequences for our actions and choices, whether those consequences are positive or negative. It is also about keeping promises, being honest and fair, acknowledging our mistakes and taking steps to make things right. Though responsibility is hugely important, it can be a difficult concept to teach children, especially young children; they tend to be very ego-centric and may not understand the concept of taking responsibility for a project or action. The good news is that it’s never too early to teach about the importance of responsibility. At a very early age, children can be taught responsibility for their toys by encouraging them to put them away when they are done playing with them. If a toy is left out and it breaks, the child can be shown that not taking responsibility for the toy led to its being broken. You can also talk about responsibility to your children by asking the following questions. What things are you responsible for at home? With your friends? At school? Think of a time when you have been blamed for something someone else did. Why didn’t that person take responsibility for their actions? How did you feel about that? When you are on a team, you have a responsibility to the other team members. Should you choose to go to a party instead of the game? How would that represent responsible behavior? As you go through your days with your children, continue using the word “responsibility” both in English and Hebrew. No matter how young our children, it helps to hear the words and to use them. Also think of appropriate times during which you can teach the children about responsibility. Above all, be patient. Responsibility is a difficult concept for even adults to master. But the more you discuss responsibility, the more you demonstrate your own ability to be responsible, the more of an impact it will make on your children. Those who think they can live without others are wrong. But those who think that others can survive without them are even more in error. I find spring to be interesting from a Jewish perspective; we move from Pesach, the festival of freedom during the early part, through Holocaust Remembrance and the mourning of those who suffered, to celebration and solidarity through Yom HaAtzmaut; the commemoration of the founding of the state of Israel. In this issue, the Jewish Foodie column has some delicious-looking recipes that can be created in honor of the Jewish Homeland’s birth. And from 1-4 p.m. on Sunday, April 29, the Jewish Federation of Fort Worth and Tarrant County, with help from the Dan Danciger/Hebrew Day School Supporting Foundation, will host a special celebration to honor Israel’s Independence Day. It will take place at Congregation Ahavath Shalom at 4050 S. Hulen St. in Fort Worth. Incidentally, prior to the celebration, a commemoration ceremony will take place at 12:30 p.m. at Beth El Congregation, 4900 Briarhaven Road, to honor the Israeli soldiers who give their lives defending the Jewish homeland (as well as those who lost their lives and the civilians who were victims of terror). Now, more than ever, we need to remember these brave men and women — without them, Israel would be in a world of hurt indeed. Attendance at the Leukemia/Lymphoma Society’s Light the Night Walk in Fort Worth in October, 2011. Attendance at the BBG regional convention in December 2011 at the Hyatt Regency at DFW to foster communication between other youth chapters within the North Texas/Oklahoma region and to elect new regional board members. Hosting the MIT (member in training) overnight event on April 14. This takes place to encourage membership growth for the chapter and offers a great many sisterhood activities to teach participants what BBYO is about. Some of the members are also keeping busy — in March, Leah represented the chapter at the Leadership Training Institute in Plano, where she met the BBYO ambassador in Bulgaria. Last summer, vice president Dorie Kaye attended Chapter Leadership Training Conference (CLTC) in Wisconsin and historian Emily Englander visited Washington, D.C. to help out with the Jewish community. Leah was also nice enough to send some photos of other events in which BBG participated. I really wish I had more room in this column to write about them. The good news, though, is there is a website (http://www.asbbg.webs.com/) that I highly encourage everyone to visit. If your child is headed off to college, the Isadore Garsek B’nai B’rith Lodge wants to help finance it through two $1,000 scholarships. The deadline for applications is May 24. Questions? Contact Dr. Barry Schneider at dr_barrys@yahoo.com or get in touch with your synagogue’s youth advisor or rabbi. Long-time Tarrant County Jewish community members Batya and Jakub Brand will be bidding adieu and moving to New Jersey to be closer to their grandchildren. They will be missed; Batya has been active in educating Jewish children and adults, while Jakub has been involved with the Jewish War Veterans and as a volunteer at DFW Airport. If you want to say goodbye to the Brands and wish them well, their friends are sponsoring a Kiddush lunch for them following services on Saturday, May 12 at Congregation Ahavath Sholom. If you’re able to attend, please contact Beverly Ross at 817-346-3416 or bross@txem.com by May 2. Also, the Brand’s friends are putting together a book/album for them; anyone who wants to say something special in a note to the Brands, or wants to submit a picture, can send this information to Beverly no later than May 1. Well, not really — the month has nothing to do with the fact that the Jewish Learning Institute’s next offering is “The Art of Marriage.” This six-session course (which begins the week of April 29) is geared toward helping participants strengthen their marriages. The topics covered in range from the need for marriage in the first place; to trying to “change” one’s spouse; to Jewish bedroom secrets; to how far to go to make a marriage work (in other words, Jewish insights on divorce) and seem to offer ideal information for anyone wanting to make his or her marriage work. Disclaimer here: I’m taking this through Chabad of Fort Worth and I’m excited because my wonderful soul mate of close to 25 years will be taking it as well. We’re celebrating a quarter of a century of marriage on June 13 of this year, and from a personal perspective, I can’t think of a better anniversary gift. The courses will be offered at Chabad of Arlington, 2136 Linblad Court beginning Monday, April 30 and Chabad of Fort Worth and Tarrant County, 5659 Woodway Drive beginning Wednesday, May 6. You can register by logging on to the Rohr Jewish Learning Institute website at http://www.myjli.com/index.html. … it’s Madeleine K. Albright, chair of Albright Stonebridge Group and Albright Capital Management LLC. But most of us remember Ms. Albright as the 64th Secretary of State of the United States, the first female to be named so under the Clinton Administration. At any rate, she’ll be the guest in a live satellite broadcast, which you can hear at 7 p.m., Thursday, May 3 at Beth-El Congregation, 4900 Briarhaven Rd. in Fort Worth. Donations are $3. A couple of days after listening to Ms. Albright, consider doing a mitzvah and donate some blood. The annual Fort Worth Jewish Community Blood Drive takes place Sunday, May 6, between 9:30 a.m. to 12:30 p.m. at Beth-El Congregation, 4900 Briarhaven Rd. This is taking place in conjunction with Carter BloodCare, and while walk-ins are welcome, it’s better to make a reservation. You can do so by calling Dan Halpern at 817-426-3239. If you were one of the 1,110 women at Monday’s Jewish Family Service Woman-to-Woman luncheon, then you probably walked away from the event feeling as though it was time well spent and money raised for a worthy cause. JFS serves our community in a myriad of ways — the food pantry, senior services, counseling and support groups and the employment resource center are but a few of its good works. I cannot imagine a better or more inspirational speaker than Academy Award winning actress Marlee Matlin. With her longtime interpreter Jack Jason at her side, Matlin delivered a speech tailor-made for the audience. She wove in her Jewish roots and her saychel about life and overcoming obstacles were self evident. Yasher koach to Event Founder Ethel Silvergold Zale; Co-Chairs Sara Efune, Eileen Franklin, Linda Garner, Dollie Thomas; and their capable committee, JFS President Todd Chanon, and Executive Director Michael Fleisher and his staff on a flawless afternoon. Anshai Torah’s daily minyan has taken hold at the Plano congregation. The synagogue’s Mike Egnal and Dr. Michael Pincus are the service staples and sparkplugs of the minyan, regrettably, initiated by the need for Dr. Pincus to say Kaddish for his parents. The egalitarian minyan, provides an opportunity for those reciting Kaddish, or for those wanting a daily place of introspection. The congregation is actively building a cadre of “minyanaires.” Welcoming regulars and guests to the services, all find an atmosphere of warmth and comfort that inspires members to participate and support each other. Shacharit, morning services, begin at 9:15 a.m. on Sunday, 8 a.m. on Monday and 6:45 a.m. Tuesday through Friday. Afternoon Mincha and Maariv services begin at 6:15 p.m., Monday through Thursday and the congregation’s Sabbath services continue on Friday evening at 6:30 p.m. and Saturdays at 9:30 a.m. While the concept of prayer can be performed alone, it is the coming together that creates a community and, in Jewish law, a community of 10 Jewish adults is required for certain prayers, including the saying of Kaddish. The name for the prayer quorum, a minyan, comes from the Hebrew root of the word for to count. Each male or female of b’nai mitzvah age counts, toward the quorum, and a community is indeed built. Anshai Torah is located at 5501 West Parker Road. For more information, or to confirm times of services, call 972-473-7718 or e-mail anshai@anshaitorah.org. The National Council of Jewish Women will hold its Installation Luncheon with guest speaker, Cecilia Boone on May 1 at the Hilton Anatole Hotel. The theme of the NCJW annual Installation Luncheon is “Planting the Seeds of Our Future,” which reflects the sentiment of the upcoming celebration of the Greater Dallas Section’s 100th anniversary in 2013. Cecilia Guthrie Boone will be receiving the NCJW Pioneering Partner Award at the luncheon, and will be the keynote speaker. She is currently the chair of Planned Parenthood Federation of America, and is a longtime leader in women’s issues, both locally and nationally. 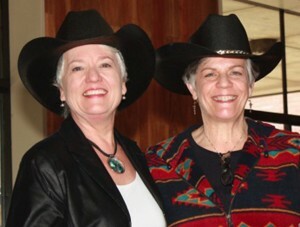 Reservations can be made by calling the NCJW office at 214-368-4405, or online at www.ncjwdallas.org. Cost of the luncheon is $60, with sponsorship levels at $100 and $200. Bobbie Kornblit, daughter of Pauline Denur of Dallas, has written “Shelter from the Texas Heat,” a new novel with lots of local references. Bobbie, who now lives in Atlanta, will be doing a book signing on April 25, from 11 a.m. to 3 p.m. at Fossee’s Shoes, Preston Forest, because that’s where she bought her “rhinestone book tour boots,” she says. She’ll also be a presenter on June 5 in New York when the Jewish Book Council holds its annual “Meet the Author” event, attended by book fair and festival selection committee representatives from across the country. “Shelter” is available at the Temple Shalom gift shop and Amazon.com, and as an E-book. The most fun and exciting event of the year for Temple Emanu-El Women of Reform Judaism is comin’ round the bend as their biggest fundraising event of 2012! On May 6, WRJ will host “Boot Scootin,’ Bingo, BBQ and Brew:” a high-steppin,’ bingo-callin,’ Bar-B-Q-eatin’ and brew sippin’ extravaganza! The Lake Highlands High School Wildcat Wranglers, a country western dance team, will also treat everyone to a special performance. Net proceeds from this fundraiser will benefit Temple Emanu-El Early Childhood Education Center, religious school, scholarships to Greene Family Camp, NFTY Trips to Israel and other youth programs at Temple Emanu-El and in the community. Various sponsorship levels are available. Individual event tickets are $72 each, which includes one dinner ticket and Bingo card. You can attend as an individual, a couple, or sponsor a full or partial table. “Gold Rush” Raffle Tickets will also be available in advance for a chance to win $3,000 in North Park Gold. Tickets can be purchased for $50 or five for $200 from the Judaic Treasures Gift Shop at Temple Emanu-El. Only 300 tickets will be sold and you do not have to be present to win. Childcare will be available at no charge by prior reservation to Debby Stein. For more information and to RSVP, visit www.tesisterhood.org, scroll down to the event name and click on it. Or, contact one of the event co-chairs: Debby Stein at 214-361-0842, debbystein@gmail.com or Denise Siegal at 214-679-9265, dssiegal53@gmail.com. 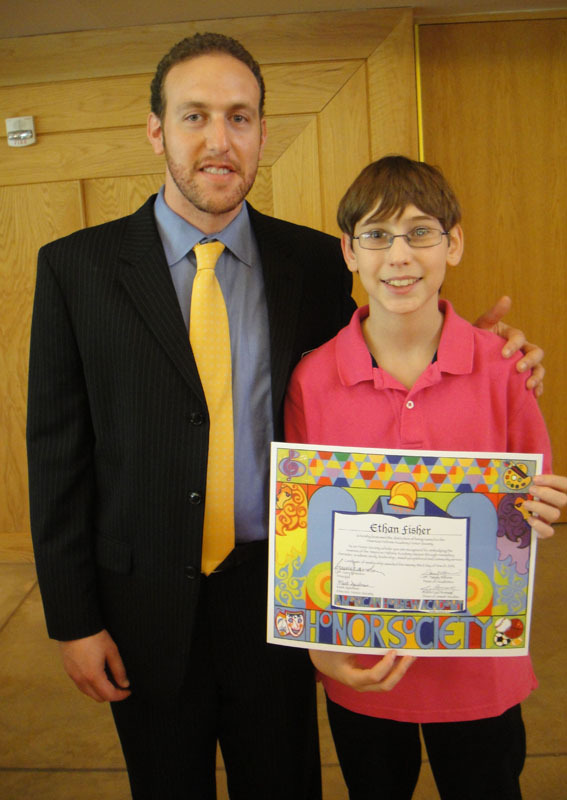 Akiba Academy student Ethan Fisher of Dallas, and Levine Academy student Shira Hovav of Dallas have been accepted into the esteemed American Hebrew Academy Honor Society. Ethan is the son of Laurel and Mark Fisher and Shira is the daughter of Diane and Shmuel Hovav. The Academy, America’s premier Jewish pluralistic college-prep boarding school, recently extended invitations to 60 students nationwide for admittance into its exclusive organization. Now in its third year, the American Hebrew Academy Honor Society is an international honor society that acknowledges exceptional eighth and ninth grade students, like Ethan and Shira, who have demonstrated excellence in academics, athletics, the arts, leadership and service to their communities. The Honor Society is modeled after the National Honor Society, receiving recommendations, applicant questionnaires and transcripts in an effort to identify the most outstanding young Jewish students in the U.S. and beyond. Along with the other students who have been inducted into the Honor Society, Ethan and Shira were invited to attend a Scholars Weekend at the Academy from March 23-25. Shira was unable to attend the induction due to Levine Academy’s eighth grade trip to Israel. However, Ethan did attend with mom Laurel. He was presented with an award certificate designed by Mordecai Rosenstein during the induction ceremony. Don your green t-shirt and head to the Aaron Family JCC, 7900 Northaven Road, on Friday for a full schedule of earth day events. A shredding truck from Action Shred will be in the parking lot from 8 a.m. to noon. There is no charge for the first five standard size business boxes (11×17 or smaller). Additional boxes are $2 per box, and an extra fee for boxes larger than 11×17; limit of 10 boxes per family. Please bring one can of non-perishable food for each box shredded, to be donated to the Jewish Family Service Food Bank. Get transformed and your heart pumping from 9 a.m. to 10 a.m. at the J Sports & Fitness Center. This hybrid class fuses 20 minutes of spinning, 20 minutes of TRX and 20 minutes of partner Med Ball drills to make those hearts go pitter-patter. Spin, balance and drill your way to fitness happiness. In the spirit of Earth Day, the J group exercise team will move outside to the beat of the bongo drums from 9-10:30 a.m. This “quad” fusion class kicks off with Brenda’s spin on West African Nia. Then unleash yourself with some of Brandi’s dance moves which move you into Vickie’s heart-beating drumstick pounding and winding this sweat fest down with Chinook’s bongo inspired flow yoga drum circle finish. Meet at Lewis Fountain Park at the J. What is TRX Suspension Training? You can discover the revolutionary method by leveraging your body weight to safely perform exercises building power, strength, flexibility and mobility. Join TRX-certified instructor Ben Williams for this introductory workout from 10:15 a.m. to 10:45 a.m.
From noon to 1 p.m., join the J Fitness Center where the music is up and there are stations for a one hour non-stop workout. Certified trainers will be on hand to lead participants through a variety of exercise stations. From 1:30 to 2:30 p.m. explore the new J Naturescape. Nature is important, not just to kids, but for everyone. See what a natural environment can do for your spirit. Meet in the J lobby learn about the Nature Movement. With this we complete the last of our 13 Principle series, which has covered the core beliefs of Judaism. Maimonides writes in his commentary to the Mishnah, that the 13th Principle involves the “resurrection of the dead.” The “Ani Maamin” recitation in the Siddur states: “I believe with perfect faith that the dead will be brought back to life when God wills it to happen.” Maimonides further codifies this belief in his “Code,” based upon a very strong statement from the Talmud that one who denies the resurrection of the dead will have no portion in the World to Come, (Yad, Teshuva 3:6 based upon Sanhedrin 90a). To sum up the words of the other commentaries, there will be a period subsequent to the Messianic age called the time of the resurrection, during which the righteous throughout history will be revived and live eternally. The body will be reconnected to the soul and they will live on as partners forever. The body will not be anything like the one we know now; it will be an almost spiritual entity, nearly transparent, with the light of the soul shining through it rather than covering up the soul as it does now. This belief is not “just” another of the 13, although all 13 are extremely important. We have a principle in Judaism that the last of a list is the most important; in fact, it is the one to which all others lead. For example, all the plagues in Egypt led to the last one, the killing of the first born, which encompassed all the others. Why is this principle, one that seems quite obscure and beyond our grasp, so significant? One of my mentors explained that this principle underlies all we believe in Judaism; Torah is a practical belief and not anything like a philosophy that is purely theoretical. All Torah knowledge is coupled with practice, the mitzvot. There is no mitzvah that can be performed with the soul alone. Every mitzvah requires a partnership between body and soul. A soul by itself can not light Shabbat candles, give tzedakah or lay tefillin. Since the soul, throughout its sojourn in our world, required the help of the body for all the good it performed, it is only fair the body should share in that eternal reward. The grace and beauty of the eternal body emanates from our present body, much like the graceful, beautiful butterfly is the transformation of a very plain, gray caterpillar after it emerges from its “grave”; its cocoon. Another of my mentors explained that the resurrection in which we believe is not simply that God will give continued life to those righteous who have died. It goes much deeper, stating there are two levels to our existence in this world. There is an existence for the here and now and a transcendent level of our existence that is for the next world. Only in the next world will we truly fathom the impact of our actions in this world. The resurrection will be a time in which we can relive our lives, reaping the rewards (or otherwise) from all that we have done in this world, with the full impact of those actions completely revealed. May we all merit to a share in the bliss of that world!